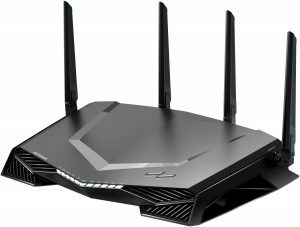 NETGEAR, the leading provider of networking devices; that powers today’s smart homes announced the launch of the most awaited flagship product, the new Nighthawk® Pro Gaming WiFi Router (XR500)at League of Extraordinary Gamers, Indiranagar Bangalore. The new groundbreaking NETGEAR Nighthawk® Pro Gaming WiFi Router (XR500)leverages advanced cutting-edge software to optimize network connections by stabilizing ping, reducing lag spikes, and keeps you always on with reliable wired and wireless connectivity for advanced online gameplay. The Gaming Dashboard, Geo Filter, Quality of Service (QoS) and Network Monitoring capabilities enable customization and gaming performance unmatched in the router space. NETGEAR Nighthawk includes best-in-class hardware features such as a dual-core 1.7GHz processor, Quad-stream Wave 2 WiFi with MU-MIMO, and four external high-power antennas wrapped up in an aggressive and formidable enclosure. • Gaming Dashboard — on a single screen, views real-time bandwidth utilization by the device, ping delays, and many other parameters. • Geo Filter — Fix your gaming lag by limiting distance to servers or other players, get a guaranteed local connection, and create black/white lists of your preferred servers. • Quality of Service (QoS) — Prioritize gaming devices and allocate bandwidth by the device to eliminate lag due to queuing at the ISP network. • Gaming VPN — Protect your network identity, prevent DDoS attack, and use the VPN client to connect to the VPN server. • Network Monitor — Check on bandwidth-hogging devices and identify the applications which could be causing lag. • Gigabit Ethernet Ports — Maximize speed with four (4) GbE LAN ports for wired connections, ideal for fast-paced gaming and high-quality streaming. • 802.11ac WiFi — Enjoy Multi-User MIMO (MU-MIMO) for simultaneous streaming, Quad-Stream and 160MHz for faster speeds. • Dual-Core 1.7GHz Processor — Support more devices for better 4K streaming, VR gaming, surfing, and more with this powerful, faster processor. • AC2600 WiFi — Take advantage of up to 800+1733 Mbps* wireless speed, and double the available bandwidth with simultaneous dual-band WiFi. • High-Performance Antennas — Get better WiFi coverage and faster speeds with four (4) external antennas. • Memory — Enjoy plenty of headroom with 256 MB flash and 512 MB RAM. • Beam forming+ — Enjoy more reliable connections for fewer drops, providing jitter-free network performance.